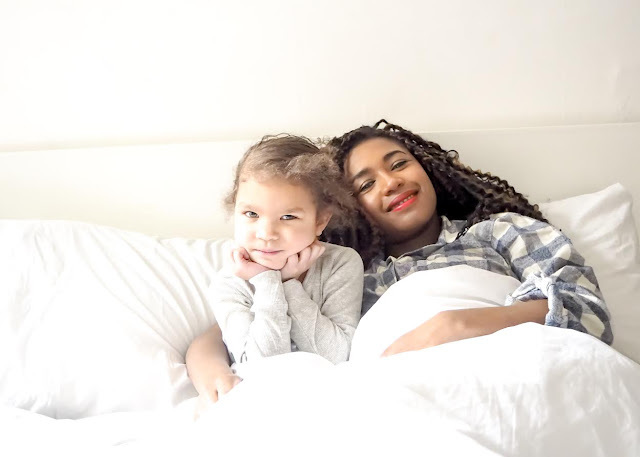 Our bedtime routine is one thing I look forward to most, it is a special time for me and Leanora to catch up about our day's shenanigans, cuddle up and watch tv and read a good book before we snooze off. Now let me be frank, we do not have a set time because I work such crazy hours, and especially if I have to collect Leanora if she is at my sisters or families house. No two days are the same, in this household but the build-up to when we go to bed, I can safely say is the same........sometimes! Now I know each family do things differently, but that is what makes us all unique, we all have the same best intentions, in making sure we and our family get a good 40 winks. So for those with busy lives, a good sleep routine for you and your kids is extremely important. For those who have a small home, such as mine, which is a one bed flat and Leanora sleeps with me it's vital to keep the same pattern for the little ones and for you. After dinner, we normally have a nice relaxing hot bath, we brush our teeth together, she makes sure I've done mine, and I hers, normally watched by Milo perched on the toilet, keeping an eye on us and letting us know, that yet again, he is our little fattie and wants more dinner. Brushing teeth is vital as I know kids hate it, but I find that if you introduce fun games or a little blackmail plus a good toothbrush with there favourite character on it, it usually does the trick. Every night, ever since Leanora was born, a good massage after the bath with some of our favourite products from Neals Yard, such as the Pure Baby Oil works like a treat, especially when we have such cold weather and her eczema flares up, which has now spread to the poor things back, but happily and I can safely say it has eased, I've only been using this product on her, and it is perfect for her delicate skin, this product is organic, free of parabens and fragrance free, which will does leave her skin irritated, but softens and soothes her eczema prone skin, thanks to the Jojoba and sunflower seed oil. Comfy pj's on, which are kept nice and warm by being on the radiator whilst bathtime is happening, helps settle anyone down, I mean is there anything better than toastie pjs? Next, Boden, M&S and Primark to have some great ones to choose from for the whole family. Safely tucked in bed, and on our new soft as feather memory foam mattress, from Mattressman, we settle down and watch one of our favourite programmes, Secret Life of the Zoo. We are big animal lovers and we love nothing more than a good documentary, which quenches are thirst after Blue Planet II. TV now off, we snuggle before we snooze with one of our new favourite books, 'The Bear and the Piano' which we read every night, what can we say we like our creature comforts and when I've read it a million times over, I sing Leanora her favourite song, Twinkle, Twinkle Little Star before we snuggle up in our new bed from Mattressman in to a land of nod. Not every night is as easy as that, especially if Leanora wants to watch her IPad, but no matter what we try and stick with the same routine, we just try to find a groove that works for us both, plus a great bed and mattress, will certainly aid a good nights sleep, and it is worth investing in and Mattressman will be able to care of the whole family needs. I would love to hear your tips and tricks to get your little ones off and would love for you to share them below. A massive thank you to Mattressman for collaborating with us on this post.